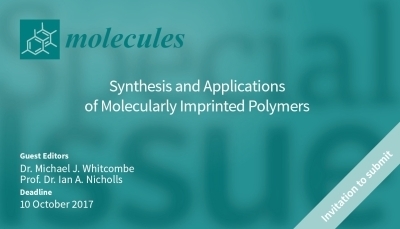 Prof. Ian Nicholls and Dr. Michael Whitcombe are currently editing a Special Issue of Molecules "Synthesis and applications of molecularly imprinted polymers, please follow the link to view the call for articles. When submitting your article, state that your are a member of the SMI and claim 10% off the normal publication fee. I suggest that the corresponding author has a current profile on mipsoc.org to verify their membership. Log-in if you wish to post a reply. Log-in if you wish to post a new comment.